Crystalinks Celebrates Its 14th Anniversary! I had dinner with Pat tonight and we toasted not only the 14th anniversary of Crystalinks, but the 14th anniversary of her mannequin business. We talked about the huge energy shift that came through the grid today, affecting those on our frequency. Something has shifted and we shall see how it all plays out. Laughs and fun with Pat was topped off by a beautiful sunset this evening. I will never forget the day Crystalinks went online. A techie named Steve, from a NYC internet based company called Interport, took my original 50 files, uploaded them ... and I was thrilled beyond words. A journey had begun and more surprisingly, 250 people found me that first day. The home page was called http://www.crystalinks.interport.net/index.html. In 1997 I would chose a domain name ... www.crystalinks.com ... after considering ... www.elliecrystal.com. Everything on Crystalinks has changed over and over again through the years - but I have never lost my passion for Crystalinks as most people and bloggers did with their websites. I watched them go down, year after year, as Crystalinks remained a place for people to visit and find answers moving consciousness through time. Now science has come to understand that reality could perhaps be a hologram, as my theories are coming into light and consciousness. Today, a book proposal arrived at the office of Reid Tracy, the head of Hay House publishing, as per his request. Will Ellie become the next Sylvia Browne ... who has just retired? No thank you! Let's see how the proposal goes. This was not my idea so I'm open for whatever happens. I have met so many amazing people from all walks of life through Crystalinks ... the list goes on and on ... and has made the time here well spent. All I know is that I'm leaving soon - I'm not sick or anything that melodramatic ... just time to move on. 2012? Another wake-up metaphor. Crystalinks has come a long way since 1995 in terms of quality, content and readership, generally averaging over one million visitors each day. 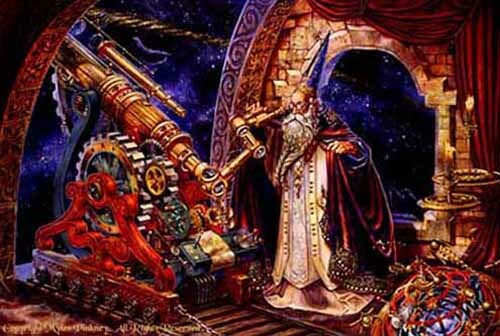 Crystalinks has developed into a compendium of over 10,000 files and growing, that integrate science and meta-science, physics and metaphysics, merging everything for greater understanding. Through the years Crystalinks has become a place readers can return to find answers within the parameters of evolving consciousness. As a healing tool, it has helped millions of readers evolve into greater awareness as the human experiment, through which we virtually experience, returns to higher consciousness. 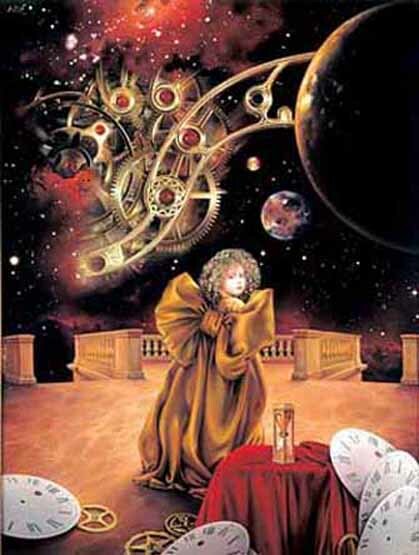 The overall theme of Crystalinks is simply and has never wavered -- Reality is a consciousness hologram through which souls virtually experience to learn and record their experiences. It is a biogenetic experiment in linear time (physical reality) to experience emotions. Reality has a beginning and an end - the evolution of consciousness in the alchemy of time. A transformation is occurring on all levels, coinciding with the Age of Science and Technology which guides us along the way. Crystalinks remains a Work in Progress as does your journey here. Dear Ellie: Happy Anniversary Crystalinks. Ellie's vision has always rested on a firm resolve that what is unseen is the foundation we must pay attention to now, while what is seen is but a preface for the larger reality. Her compilations of ideas, art, concepts, research and discovery all lead to the inevitable conclusion that we are a part of a spinning holograph...and Ellie is the trusty needle on that record, playing for us all her magical melodies, echoing over the span of her beloved bridge. Hi Ellie!!! Wow, has it really been 14 years!? Time sure flies. What else can I say that hasn't already been said but a resounding, hearty and very heart-felt THANK YOU for all you're doing and have done. Your approach is unique as you don't believe in 'sugar-coating' the truth (and thank God for that!) and in true 'Noo Yawk' fashion, you "Tell it like it is!!!" Like everyone else who's been guided to find your site, I've learned so much from you. I felt like I already KNEW it all, but being the noble teacher you are, you hammered the metaphysical points home in a fantastic way that makes perfect sense and helped us all grow. Food for thought, indeed. ... As I sing "Merrily, merrily, merrily, merrily, life is but a DREAM!" I raise a toast (ok, so it's coffee, not wine) to YOU and to life and (en)light(enment)! Crystalinks has become a part of my daily reading and I have received much enlightenment and pleasure from its perusal. Although I have not experienced a reading from you yet-- as if you had time!, just reading the insights on your blog have in effect been the source of introspection that I would call therapeutic. And you have such a wonderful wicked sense of humor. May the Gods Bless you Ellie. One of my great attractions to Crystalinks, which will be no surprise to you, is I feel the synchronicity that much is to be revealed shortly -- our origins on this earth, and the denouement of the program. I CAN put this into words, as Crystalinks has provided much source material for my own writing, but I will save that for the opportunity when I can get a reading scheduled. YOU have been the catalyst for deeper insight and empathy to thousands, millions even, not "nuts," or the crazy hippie type, but intelligent people searching for deeper import of the ineffable mysteries of our existence. The only goal of any artist is to provide HOPE -- you have done that through Crystalinks. The HOPE is that we will all go home soon, and until then, humor, and courage, which go hand-in-hand, are the answer to the "Dark Side of the Force." Rock on. All the best. Just wanted to say Congratulations on 14 wonderful years of blogging and how much it has meant to me since I started to follow you. Remember that very first email I sent you about your Ozzy happenings during the "Lost Book of Nostradamus" tapings? What a wonderful synchronistic stumbling that was on the world wide web! And my, how you've helped me grow since then! Well, wouldn't you know it, but August 25, 1939 is when "The Wizard of Oz," hit theaters Nation Wide. The 15th, it premiered at Graumman's in Hollywood and the 17th, it premiered in NYC (my favorite stomping ground). It wasn't a huge hit at first, but as everyone knows, it soon grew and continues to be one of the most beloved films of all time; just as Crystalinks seems to be growing as well, and is fastly becoming and integral part of many peoples every day lives. Thank you so much Ellie, for all that you do. I couldn't begin to tell you all of the little synchronicities of your blog that have affected my every-day life. My father's death would have to be the largest; the day he died I was "lead" to a part of your blog about your friend JoAnne, I believe, who had a family member die of a heart attack. Hours after I read that entry, my father had passed away of a heart attack. A year to the day after his passing you had written about how three small roses appeared in your living room. My Grandmother's maiden name was Rose, and to me, the three flowers signified my Father, his Sister who had passed at a young age, and my Grandmother. So, Thank you, Ellie. Your messages mean so much to your readers. I look forward to many more years of reading. Congratulations Ellie, Crystalinks is a great source of inspiration and information for so many. I have been reading it since the 90's and watched it become THE pulse for metaphysical awareness on the net. Way to go, Ellie! Ellie, Congratulations on 14 years with Crystalinks! It is truly amazing, and a testament to your character and perseverance that you have stuck with it all of these years and brought so many to the point of "getting it." I have been part of the journey too, and I want to thank you personally for allowing me to play a small part in it all, while also teaching me so much. 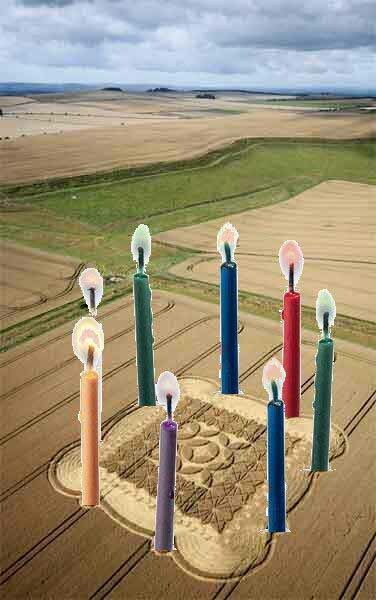 Hi Ellie, Attached is a birthday cake courtesy of the UK 'crop circle makers', whoever they are. Blow out the candles and make a wish for the 15th year. I feel the crop circle was meant as a gift complete with 8 candle holders. Keep up the good work cutting through the illusion. It's a piece of cake! Cheers from Down Under! by the Lion and the Girl. 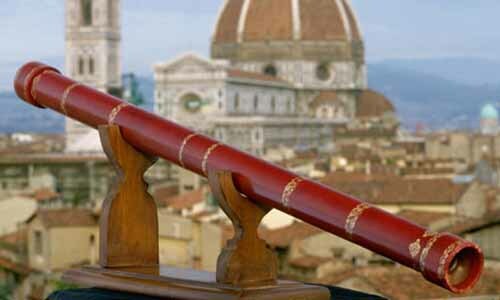 Exactly 400 years ago today, the Italian astronomer and philosopher Galileo Galilei showed Venetian merchants his new creation, a telescope � the instrument that was to bring him both scientific immortality and, more immediately, a whole lot of trouble. 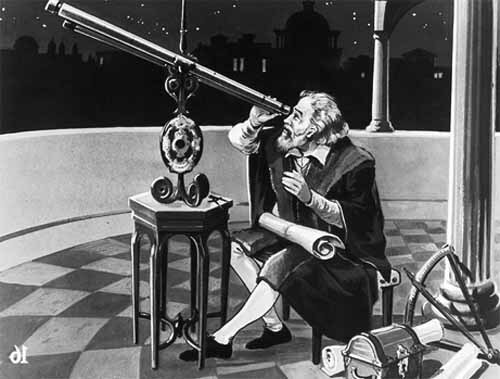 It is 400 years since Galileo Galilei demonstrated his telescope, which would lead him to make new astronomical observations. While many people have been loudly celebrating this year's double commemoration of 200 years since Charles Darwin's birth and 150 years since the publication of On the Origin of Species, another scientific anniversary has crept up relatively quietly, marking an event which arguably changed human thought and the way we see ourselves even more irrevocably.